There’s a palpable excitement around these parts when we get to try out a new Marvel slot and we’ve been looking forward Spider-Man for a long time. This is not to be confused with Cryptologic’s dated Amazing Spiderman; Attack of the Green Goblin is from Playtech, master of the Marvel slot conversion. Being a Marvel slot it also contains the Playtech progressive jackpot. What we have here is a five reel and twenty five payline game which is packed with bonus features and is accompanied by an appropriately dramatic soundtrack. The transparent reels are set against a background of night time skyscrapers and all the main symbols are Marvel-related so include the Daily Bugle, a camera, skyscrapers, Mary Jane Watson and the Green Goblin. Basic symbols are 9, 10, J, Q, K and A. The bonus symbols are a wild labelled ‘Wild’ and a Spider-Man bonus which activates the many bonus games. These two features are randomly activated in the main game but can’t both be triggered together. Spider-Man Wild – This is triggered randomly during the base game and Spider-Man will occasionally appear and shoot webs at two, three or four reels; those reels will remain wild for the next spin. Spidey Snapshot Feature – Every now and then our hero will dangle down upside down from the top of the screen and get snapped by a camera; this of course means that you win a cash prize of between 3x and 10x your total bet. 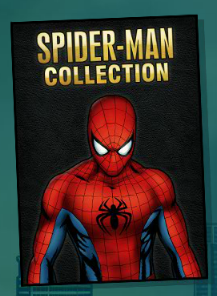 Rivaling Free Games – this is another free spins round but here you’ll start with ten; each time a spider-man logo appears on reel three the spin counter will stop, meaning potential unlimited spins. A pumpkin on reel three restarts the counter. While the counter has stopped, another spiderman logo on reel three increases the multiplier by 1x. The pumpkin on reel three will reset this. Radioactive Free Games – fifteen free spins are won here but a green spider logo is added to reel three; land it and it will dispense more green wilds on reels two and four. City Chase – hunt the Green Goblin down by swinging between the buildings with your web and collecting red spider logos and masks along the way. When you reach bonus points, pick an item to reveal prizes. Collected spiders and masks will help extend your mini-game and aid you in picking the best prizes. Ultimate Fight – the best feature in our opinion – you get to fight the Green Goblin in a Street Fighter-style contest. Select question mark icons to reveal which attack to use; get three strikes in a row for a combo strike. You’ll win a prize whatever the outcome of the fight but if Spider-Man wins the prize is greater. 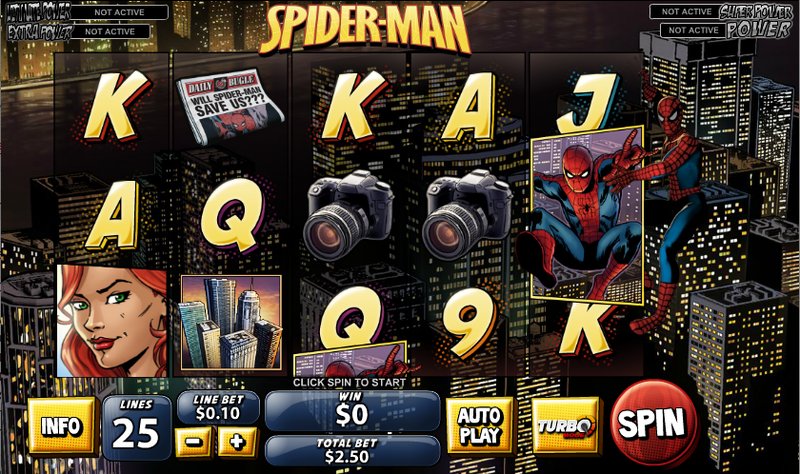 Now for the big money and most slots fans will be familiar with the Marvel progressive jackpot. It’s randomly activated but you have more chance of winning the bigger your stakes. If you are lucky enough to land it you’ll be given the chance to pick matching jackpot symbols on a 5 x 5 grid. The biggest jackpot is Ultimate Power, followed by Super Power, Extra Power and Power. This is a brilliant slot with a seemingly endless variety of bonus games, top notch graphics and clever features; the soundtrack is dramatic the Marvel progressive jackpot just complements the fun. Try this now!